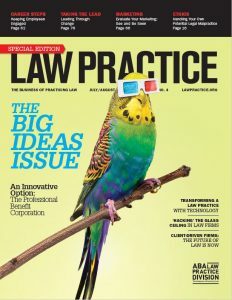 In the July/August 2017 issue of the ABA’s Law Practice Magazine, I remind colleagues, readers and friends in Evaluate Your Networking: See and Be Seen that getting back to basics through increased in-person visibility is really the best way to develop new and more business. Nothing beats in person. Much of this networking happens in the daily course of life and business. Just last week, you could say I networked with lawyers at a Little League Tournament, at a synagogue board meeting, at a bar association meeting. Next month, I’ll try to catch up with as many people as possible over a few days at the ABA Annual Meeting in New York. I’ve got a law school alumni happy hour on the books in the next week as well. Teaching two CLEs next month. And those are the ones that did not involve trying. Looking to set law firm visits to catch up with folks takes a little more work—but almost always pays dividends. A “let’s grab lunch (or coffee or a drink or breakfast)” should be a very soft sell invitation that is widely accepted. Sometimes when I do one of those lunches and immediately generate business, I get angry at myself for not doing it more. And then I fail to do it more. It is so easy. Take a look at your calendar. See how many networking opportunities are coming up. And then actually do it on purpose. The results might astound you.